Recently my wife overheard one of the older members of our church exclaim that before I arrived almost nine years ago, she’d never heard a single sermon on one of the Old Testament prophets. And she’d been a member of the church for over 40 years! This didn’t surprise me. The prophets aren’t exactly feel good books, nor do they seem to contain the kind of practical “news-you-can-use” found in the epistles and wisdom literature. And if you’re just looking for a good story, they’re frankly confusing. Nowhere is all that truer than Ezekiel. So, unless you’re one of those people that is into arcane prophecy and end-times speculation, then why should you preach the book of Ezekiel? 1. It helps people see their sin more clearly. The first reason to preach Ezekiel is that it will help your congregation see their sin more clearly. The prophet Ezekiel was commissioned to be a watchman sounding the warning for the early waves of exiles in Babylon (3:17). The problem was that the people didn’t want to hear his warning (2:4–7) in large part because they didn’t have an accurate understanding of themselves and their relationship with God. None of us likes to look in the mirror and admit there’s something wrong with us. We’d rather preach (and listen to) messages of how much God loves us, and what great plans he has for us (which is true). We’d rather mine God’s Word for practical wisdom and solid help for navigating the challenges of life (which it has). But if we never see what’s wrong with us, we won’t take action to address it. And that’s one of Ezekiel’s goals—to help us see the true nature of our problem so that we will repent and turn to God for the forgiveness and mercy we need (18:30–32). 2. It helps people to gain perspective on God’s plan. Ezekiel prophesied in the decades before and after the fall of Jerusalem and the destruction of the Temple. That cataclysmic event marks the center of his prophecy and the turning point of the book. With the city overrun and the Temple destroyed, God’s people wondered what God was doing, if his promises had failed, and if their future was gone. So Ezekiel makes plain that God will judge the nations, just as he had judged Israel (chs 25–32). The justice of God shows no partiality. But having judged his son, Israel, God would also display his faithfulness by bringing his son back to life. In an act of powerful recreation, God’s Spirit would restore Israel (ch. 37). For the sake of his own glory, he would make a new covenant with his people that could not be broken, and he would put his own Spirit in them (ch. 36). They would live peacefully and safely under David their shepherd and God himself would be their shepherd (ch. 34). This restoration would culminate in an ideal Temple (chs 40–46) and a new creation promised land (chs. 47–48), from which God would never again depart (43:7). 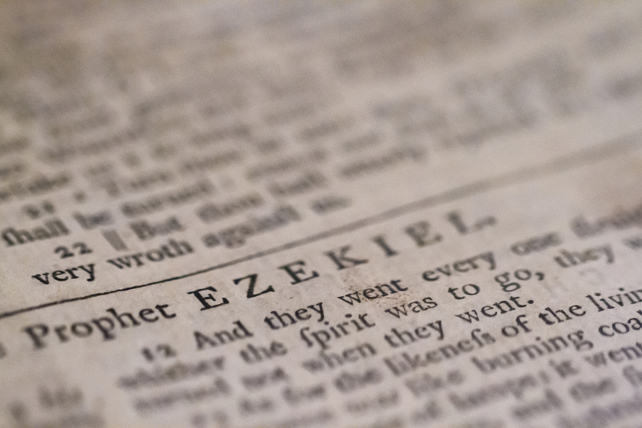 People in your congregation wonder if God has a plan, and preaching Ezekiel’s visions should give them both hope and certainty. To be sure, some of these visions are obscure in their details, but their point is clear. Christians sometimes disagree on the time and the place of their fulfillment, but not the certainty of that fulfillment. The lack of details is frustrating, but that same lack makes clear that God isn’t giving us a blueprint that we must accomplish through our politics, diplomacy or human efforts. Rather, he’s assuring us that through the power of the Spirit and the establishment of the New Covenant, fulfilled in the finished work of Jesus Christ, God will certainly accomplish what we neither deserve nor can attain on our own. It’s easy to lose perspective in the midst of life’s challenges and trials. It’s easy to be consumed and distracted by disputes over the details and timing of the last days. Ezekiel lifts our eyes and refocuses our vision on the centrality and certainty of God’s gratuitous, saving work in the gospel. Despite what we see in the world around us, or in our own lives, God’s plan was accomplished at the cross of Jesus Christ, is displayed now in the life of the church, and will be consummated in a New Jerusalem, in which there will be no temple “for its temple is the Lord God the Almighty and the Lamb” (Rev. 21:22). Michael Lawrence is senior pastor of Hinson Baptist Church in Portland Oregon and is the author of Biblical Theology in the Life of the Church: A Guide for Ministry.